PLEASE NOTE: Due to a high volume of responses for this event, REGISTRATION IS NOW CLOSED. Any new registrations will be added to our waitlist. Thank you for understanding! 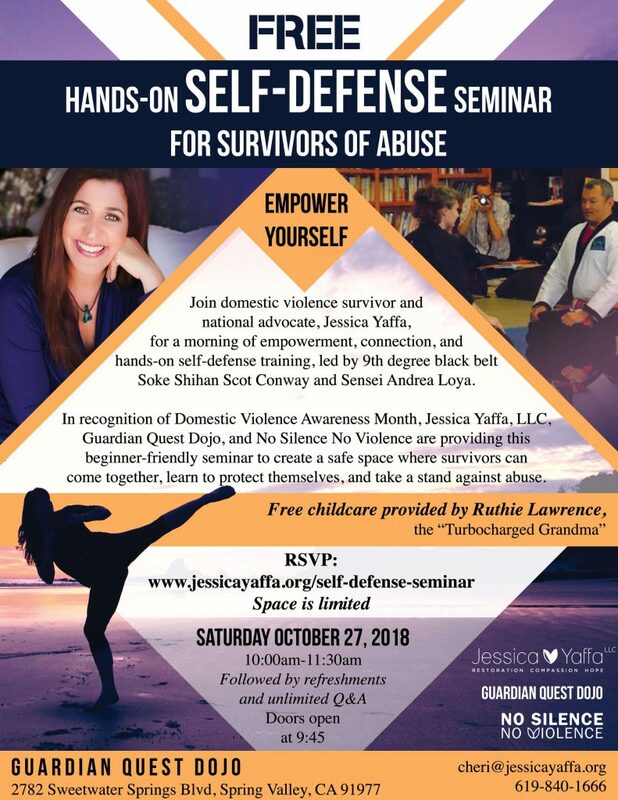 Join us October 27th as we observe Domestic Violence Awareness Month with a morning of empowerment, connection, and self-defense lessons, in a safe space provided by Jessica Yaffa, LLC, Guardian Quest Dojo, and No Silence No Violence. Together, we will stand against abuse. Please RSVP below to reserve your spot. This event is free and open to all survivors of abuse. Childcare will be provided at no charge. Please share! Download a printable flyer here. Would you like to include a message with your RSVP?